A natural tooth consists of a root and a crown. If you compare natural teeth to implant-supported replacement teeth, you’ll see they have the same basic parts. Both have a crown (the visible part used to chew food). Both have a root that holds the tooth securely under the gum and is anchored into the jaw. The difference is that the implant is made of titanium — the same time-tested material used by surgeons for artificial joints. When you lose a tooth, you lose both the root and the crown. To replace the tooth, the surgeon first replaces the root with a small dental implant. For years I’d felt like a part of my body was missing — because my teeth were missing. 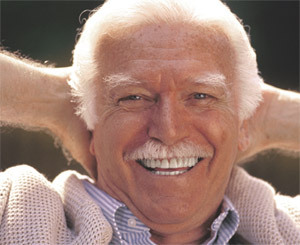 My dentist told me that dental implants would make me feel and look a lot better. OK, I said. Now, I’m thrilled. I can smile, eat anything, and enjoy a good laugh with my friends. Using the most recent advances in dental implant technology, Dr. Roach and Dr. Ouellette are able to place single stage implants. These implants usually do not require a second procedure to uncover them. There are even situations where the implant can be placed at the same time as the tooth extraction — further minimizing your number of surgical procedures. Dental implant placement is a team effort between an Oral and Maxillofacial surgeon and a restorative dentist. Drs. Roach and Ouellette perform the actual implant surgery, initial tooth extractions, and bone grafting if necessary. The restorative dentist (your dentist) fits and makes the permanent prosthesis. Your dentist will also make any temporary prosthesis needed during the implant process. Sonterra Oral and Maxillofacial Surgery proudly serves the following locations: Boerne, Bandera, Castroville, Fredericksburg and New Braunfels/Gruene.